From kitchen cupboards to university laboratories, drugs are found all around us and touch us all at some point in our lives. For some their effect is fleeting and temporary but for others it can consume and dominate their lives. In this collection are three distinctive stories that explore how drugs, both legal and illegal, can affect the lives of those who use them and those who make them. These three stories show the effect of drugs on a variety of characters, looking at Absinthe, LSD, Speed and medicinal drugs in unadulterated, eye-opening stories that show the delights and dangers of drugs. Hearkening backwards towards periods of popular drug use whilst also taking a close look at modern day addictions, Drugs for all Reasons immerses the reader in a variety of worlds as its characters rise or fall at the whim of narcotics. 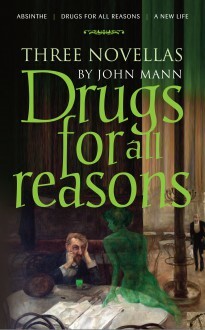 Written by former professor of chemistry John Mann, who has previously published three popular books on drug history and abuse, these vibrant tales provide an authentic insight into the lives of those touched by drugs. Drugs for All Reasons is a collection of stories that dare to look into the uncertain realm of drug use and abuse which surrounds us…even if we don’t know it.